The Audiovisual Media Services Directive (AVSMD) offers a once in a decade opportunity to protect children from commercial communications on alcohol and unhealthy foods. EHN supports the joint statement published today by EPHA on improving the Audiovisual Marketing Services Directive (AVMSD). The EC proposal for a new audiovisual media services directive (AVMSD) offers a unique opportunity to protect children from advertising linked to unhealthy eating behaviour. Please click here for the statement by the European Heart Network made at the 66th session of the WHO Regional Committee for Europe, Copenhagen, 12-15 September 2016, on the NCD action plan (2016-2025). New data on the burden of cardiovascular disease (CVD) in Europe for 2016 are published today in the European Heart Journal. 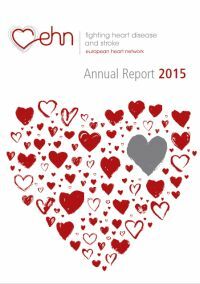 The EHN Annual Report 2015 is now available. The European Chronic Disease Alliance (ECDA), a coalition of 11 European health organisations, has signed along with several other organisations an open letter to Commissioners Frans Timmermans, Vytenis Andriukaitis and Jyrki Katainen, expressing concerns about the Commission's commitment to act with resolve on chronic diseases. Please click here to read the letter. The European Heart Network (EHN) hails the ruling in the case Philip Morris vs Uruguay - the tribunal recognises the right of the Uruguay government to put large pictorial warnings on cigarette packs. Today, 17 June 2016, the Health Council adopted Council Conclusions on Food Product Improvement, asking member states to have national plans for food product improvement in place by the end of 2017.